When you make a window selection, objects completely enclosed in the selection rectangle are selected. To make the mouse always use either a window or crossing selection, see Mouse Options, Mouse group select. When you make a crossing selection, all objects inside or partially inside the selection rectangle are selected. Use the mouse wheel to cycle through the list. To configure the selection menu, see: Selection Menu Options, or right-click the Selection Menu title bar. Only whole objects in blocks can be selected. For example, you can select a box in a block, but you cannot select its faces or edges. Whole objects and sub-objects in nested blocks cannot be selected. Command-line selection filters work on a more limited set of sub-objects for commands that ask you to select objects after the command starts (post-select). These commands let you use filters to pick a sub-part of an object or specific objects rather than the whole object. Sub-object parts can be selected and de-selected using capture tools: SelWindow and SelCrossing, Lasso, SelBrush, SelCircular, SelBoundary, SelVolumeSphere, and SelBox. The SelectionFilter command opens the Selection Filter control. The Selection Filter restricts any selection mode (SelWindow, SelCrossing, SelAll, etc.) to specified object types. Checking all checkboxes also turns off selection filters. Ctrl + Shift + click selects an object. Points, Curves and Surfaces checkboxes change to Points/Vertices, Curves/Edges and Surfaces/Faces. These make it possible to, for example, select vertices, edges, and faces of a polysurface when the Polysurface checkbox is unchecked. Sub-objects only works when Point/Vertices, Curves/Edges or Surface/Faces is checked. Restricts the selection to point objects, and with the Sub-objects checked, polysurface/mesh vertices. Restricts the selection to curve objects, and with the Sub-objects checked, sub-curves and polysurface/mesh edges. Restricts selection to surface objects, and with the Sub-objects checked, polysurface/mesh faces. The selection filter works for pre-selecting sub-parts of objects using Ctrl + Shift + Left-mouse click. Sub-object pre-select honors Selection Filter settings. This only affects polysurface face and edge selection. Since edges are essentially curves, and polysurface faces are surfaces, if you clear the Curves check box, edges won't select when you hold Ctrl + Shift and click. If you clear the Surfaces check box, polysurface faces won't select. Set the filter to Points. Use the SelColor command to select red objects. Set the filter to Curves. Set the filter to Surfaces. With the mouse over the Selection Filter control press Ctrl or Shift. Press Ctrl and hover over the Selection Filter control. Click the buttons for the object types you want to select. The command determines that the objects can be used and proceeds without further prompting. The command may proceed, but the result may be unexpected. The command cannot determine which objects are to be used and the pre-selected objects are unselected, and you are prompted to select specific objects again. Options may not appear at the command prompt. The SelNone command does not run inside a command to clear pre-selected objects. Delete or rebuild the object. Note: The SelVisible command does not work with block instances since they are drawn using their own draw lists that have no relationship with other objects in the model. Objects outside the viewport boundaries but within the boundaries of the selection object can be selected. The view can be panned during the selection to bring more objects into view. Use the CullControlPolygon command to hide control points and mesh vertices behind objects. The selection wire boundary is used as the boundary. The testing is done in double-precision floating point in screen space. If any part of the object is even slightly outside the selection boundary, it will not be included. A selection mask bitmap is built from the boundary, and the objects are tested against that mask. The testing is done using a bitmap selection mask, which effectively adds an average of half a pixel wide fuzz zone around the selection boundary. Objects that visually seem as though they should be included, but are actually partially outside the boundary, are still included. Click and drag or click repeatedly to draw the stroke. By default it uses crossing select: objects touched by the stroke are selected. Click and drag for each polyline segment to select points. Use individual disjoint segments to select. Or, hold Ctrl and move the cursor up or down to change the brush size dynamically. Selects objects / sub-objects regardless of their visibility. Only selects visible objects / sub-objects. Use Selection Filters to change what types of objects / sub-objects are selectable. The SelBrushPoints command selects points, control points, and points within a point cloud with a drag of the mouse to simulate a brush stroke. To unselect, press Ctrl while brushing selected points. The SelFence command selects objects based on drawing a line through objects. Only objects crossed by the line are selected. Select an existing curve as the selector. The SelVolumeObject command selects objects enclosed by an extrusion object, surface, polysurface, or mesh. The SelAnnotationStyle command selects annotation objects based on their style. The AddNextU command adds the control point in the positive u direction to the selection. The AddNextV command adds the control point in the positive v direction to the selection. The AddPrevU command adds the control point in the negative u direction to the selection. The AddPrevV command adds the control point in the negative v direction to the selection. The NextU command selects the control point in the positive u direction. The NextV command selects the control point in the positive v direction. The PrevU command selects the control point in the negative u direction. The PrevV command selects the control point in the negative v direction. The SelControlPoint command selects all control points on a curve or surface. The SelControlPointRegion command selects a range of control points on a curve or surface. If curve or surface control points are pre-selected, the command expands the selection to cover all control points between the limits set by the selected control points. 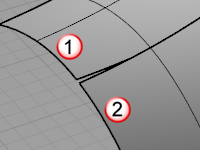 If nothing is selected, the command asks to select a curve or surface, and then asks for two points that define a region of control points to select. The SelU command selects all control points in the u direction. When Make control polygon pickable is enabled, double-clicking a control polygon selects all control points in the row. Hold down Ctrl and double-click to deselect a row of control points in selection. The SelUV command selects all control points in the u and v directions. The SelV command selects all control points in the v direction. The SelDetail command selects all Detail view rectangles in the current Layout viewport. The SelPicture command selects all objects created with the Picture command. The SelPlanarCrv command selects all planar curves. Inside a command that accepts chain selection, type chain. Controls the level of continuity required between segments to be selected. This command only works on meshes with UV information. Polygon mesh vertices are not completely surrounded by faces are displayed. Joined meshes, such as those made by the MeshBox command, have naked mesh edge points where the sub-meshes are joined. To eliminate naked mesh edge points, match them in pairs, and then use the Weld command to make a single mesh that cannot be exploded. Edges that formerly rendered sharp will shade rounded, unless you use the FlatShade command. The SelClosedSubD command selects all closed subdivision objects. The SelOpenSubD command selects all open subdivision objects. The SelSubD command selects all subdivision objects. The SelPlanarSrf command selects all planar surfaces. Objects on hidden or locked layers cannot be selected with SelName. The SelKey command selects objects by their user attribute key. The SelValue command selects objects by their user attribute value. The SelKeyValue command selects objects by their user attribute key and value. When using the script version -SelLayer, separate sublayer names from parent names with double colons (::) in the form <ParentLayer>::<Sublayer>. If the layer names contain spaces, surround the names with quote marks. The number of the first layer is zero. Each layer has a number that is assigned to it for a Rhino editing session. The numbers may change when the model is closed and then reopened. This number has nothing to do with the order the layers appear in the layer dialog box. Deleted layers keep their number.